Having completed the opening Australian chapter and New Zealand after that, Vedangi is close to wrapping up the Canadian leg of her journey, cycling around the planet. 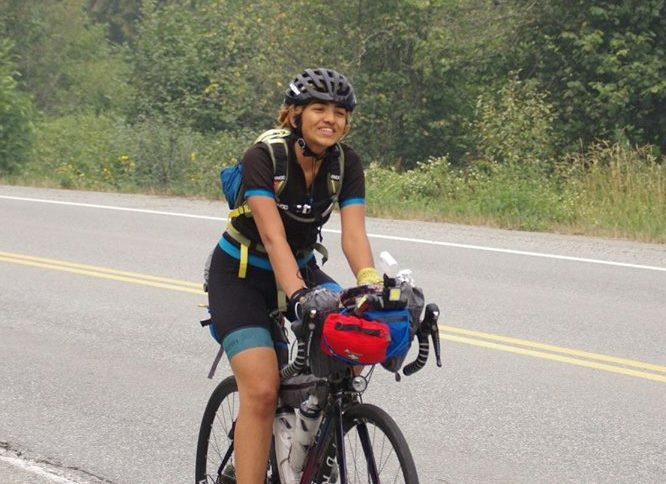 Vedangi Kulkarni, who is attempting to be the fastest woman cyclist to go around the planet unsupported, has covered more than three fourths of the Canadian leg of her journey. On September 9, her father Vivek Kulkarni informed that Vedangi had reached Ottawa, the capital of Canada. At that point she had covered 9020 miles (14516 kilometers) since commencement of her trip in Perth, Australia. This approximates to half the distance required for circumnavigation. It took her 54 days and some hours (but less than 55 overall, as per Vivek) to cover the distance. On her Facebook page, the young cyclist wrote: How do I feel? Grateful! I feel grateful for the colourful sunrises and sunsets, the mountains and the flat lands, the tarmac and gravel paths, the beautiful trees, creeks, rivers and lakes, the howls of the wolves and close wildlife encounters, the pleasant temperatures and freezing cold, the thunderstorms and stormy winds and tailwinds, and above all, to the PEOPLE who have supported me however and whenever and wherever I’ve needed – family, friends and absolute strangers! You’re my invisible peloton and I value every single one out there wishing well for me. The record Vedangi seeks to improve upon is the one held by Italy’s Paola Gianotti. In 2014 she completed circumnavigation unsupported on a bicycle – although not in consecutive stages – in 144 days. According to Vivek, Vedangi had to attend to work concerning her Schengen visa for Europe, in Ottawa. For some reason in the journey so far, this particular visa had proved tough to obtain. On September 15, in a post on Facebook, Vedangi confirmed receipt of Schengen visa. She will now proceed to Halifax in Nova Scotia to complete the Canadian leg, Vivek said. Vedangi began her passage across Canada in Vancouver. Earlier she had cycled from Perth to Brisbane in Australia (5631 kilometers) and put in an additional 1000 kilometers or so, in New Zealand. As per information available on Vedangi’s website, her journey of 18,000 miles (approximately 29,000 kilometers) will be attempted in four stages. The first stage will see her cycling through Australia and New Zealand. The second stage will see her cycling across Alaska and Canada. The third stage spans Europe, Scandinavia, Russia and Mongolia. The fourth and last stage covers China and the trip back to where she started in Australia. Given the fact that all required visas cannot be applied for and obtained well in advance, the exact route of Vedangi’s expedition has to stay open to adjustments as her journey progresses. Vedangi, 19, is currently a student at Bournemouth University, UK. She spent some part of her early childhood in Panvel (not far from Mumbai); later she attended Jnan Prabodhini school at Nigdi near Pune. Her family now resides in Kolhapur. The circumnavigation plan assumed shape sometime in September-October 2017. Vedangi’s circumnavigation attempt will take her across 14-15 countries, the final number depending on how the route is affected by visa availability. A film is being made on her journey. There will be a film crew meeting her at various points on the way.